But how does machine learning stack up against social engineering attacks? Social engineering gives cybercriminals a way to get into systems and slip through defenses. Security investments, including the integration of advanced threat protection services in Windows, Office 365, and Enterprise Mobility + Security into Microsoft 365, have significantly raised the cost of attacks. The hardening of Windows 10 and Windows 10 in S mode, the advancement of browser security in Microsoft Edge, and the integrated stack of endpoint protection platform (EPP) and endpoint detection and response (EDR) capabilities in Windows Defender Advanced Threat Protection (Windows Defender ATP) further raise the bar in security. Attackers intent on overcoming these defenses to compromise devices are increasingly reliant on social engineering, banking on the susceptibility of users to open the gate to their devices. 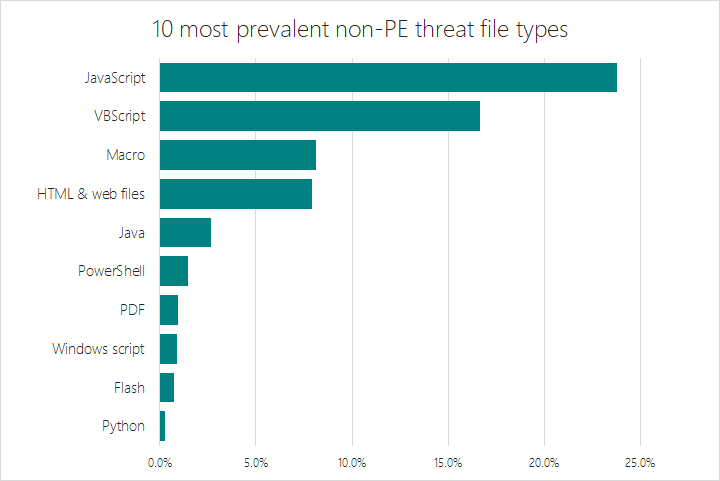 Non-PE threats are typically used as intermediary downloaders designed to deliver more dangerous executable malware payloads. Due to their flexibility, non-PE files are also used in various stages of the attack chain, including lateral movement and establishing fileless persistence. Machine learning allows us to scale protection against these threats in real-time, often protecting the first victim (patient zero). In mid-May, a small-scale, targeted spam campaign started distributing spear phishing emails that spoofed a landscaping business in Calgary, Canada. The attack was observed targeting less than 100 machines, mostly located in Canada. The spear phishing emails asked target victims to review an attached PDF document. When opened, the PDF document presents itself as a “secure document” that requires action – a very common social engineering technique used in enterprise phishing attacks. To view the supposed “secure document”, the target victim is instructed to click a link within the PDF, which opens a malicious website with a sign-in screen that asks for enterprise credentials. Phished credentials can then be used for further attacks, including CEO fraud, additional spam campaigns, or remote access to the network for data theft or ransomware. Our machine learning blocked the PDF file as malware (Trojan:Script/Cloxer.A!cl) from the get-go, helping prevent the attack from succeeding. Malware campaigns like these, whether limited and targeted or large-scale and random, occur frequently. Attackers go to great lengths to avoid detection by heavily obfuscating code and modifying their attack code for each spam wave. Traditional methods of manually writing signatures identifying patterns in malware cannot effectively stop these attacks. The power of machine learning is that it is scalable and can be powerful enough to detect noisy, massive campaigns, but also specific enough to detect targeted attacks with very few signals. This flexibility means that we can stop a wide range of modern attacks automatically at the onset. To fight social engineering attacks, we build and train specialized machine learning models that are designed for specific file types. Building high-quality specialized models requires good features for describing each file. For each file type, the full contents of hundreds of thousands of files are analyzed using large-scale distributed computing. Using machine learning, the best features that describe the content of each file type are selected. These features are deployed to the Windows Defender AV client to assist in describing the content of each file to machine learning models. In addition to these ML-learned features, the models leverage expert researcher-created features and other useful file metadata to describe content. Because these ML models are trained for specific file types, they can zone in on the metadata of these file types. When the Windows Defender AV client encounters an unknown file, lightweight local ML models search for suspicious characteristics in the file’s features. Metadata for suspicious files are sent to the cloud protection service, where an array of bigger ML classifiers evaluate the file in real-time. 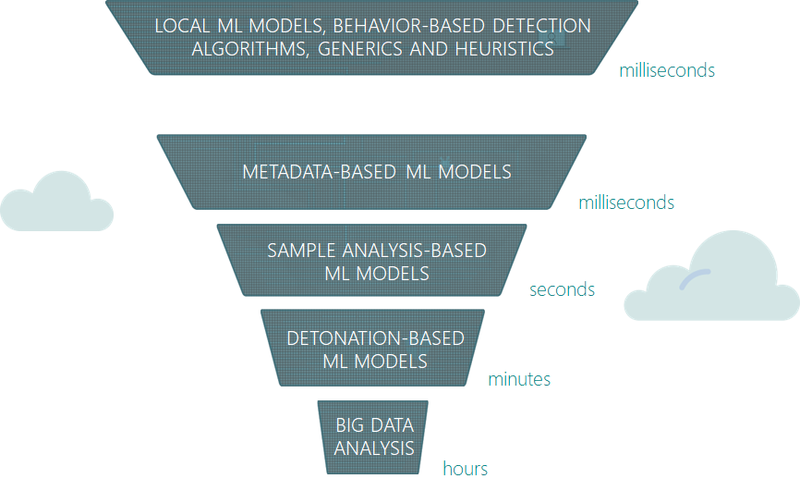 In both the client and the cloud, specialized file-type ML classifiers add to generic ML models to create multiple layers of classifiers that detect a wide range of malicious behavior. In the backend, deep-learning neural network models identify malicious scripts based on their full file content and behavior during detonation in a controlled sandbox. If a file is determined malicious, it is not allowed to run, preventing infection at the onset. File type-specific ML classifiers are part of metadata-based ML models in the Windows Defender AV cloud protection service, which can make a verdict on suspicious files within a fraction of a second. File type-specific ML classifiers are also leveraged by ensemble models that learn and combine results from the whole array of cloud classifiers. This produces a comprehensive cloud-based machine learning stack that can protect against script-based attacks, including zero-day malware and highly targeted attacks. For example, the targeted phishing attack in mid-May was caught by a specialized PDF client-side machine learning model, as well as several cloud-based machine learning models, protecting customers in real-time. Social engineering attacks that use non-portable executable (PE) threats are pervasive in today’s threat landscape; the impact of combating these threats through machine learning is far-reaching. Windows Defender AV combines local machine learning models, behavior-based detection algorithms, generics, and heuristics with a detonation system and powerful ML models in the cloud to provide real-time protection against polymorphic malware. 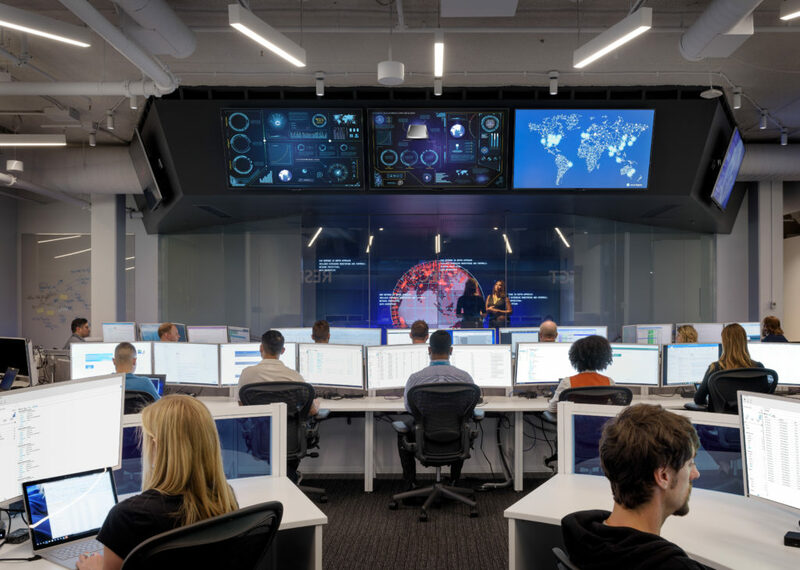 Expert input from researchers, advanced technologies like Antimalware Scan Interface (AMSI), and rich intelligence from the Microsoft Intelligent Security Graph continue to enhance next-generation endpoint protection platform (EPP) capabilities in Windows Defender Advanced Threat Protection. In addition to antivirus, components of Windows Defender ATP’s interconnected security technologies defend against the multiple elements of social engineering attacks. Windows Defender SmartScreen in Microsoft Edge (also now available as a Google Chrome extension) blocks access to malicious URLs, such as those found in social engineering emails and documents. Network protection blocks malicious network communications, including those made by malicious scripts to download payloads. Attack surface reduction rules in Windows Defender Exploit Guard block Office-, script-, and email-based threats used in social engineering attacks. On the other hand, Windows Defender Application Control can block the installation of untrusted applications, including malware payloads of intermediary downloaders. These security solutions protect Windows 10 and Windows 10 in S mode from social engineering attacks. Further, Windows Defender ATP endpoint detection and response (EDR) uses the power of machine learning and AMSI to unearth script-based attacks that “live off the land”. 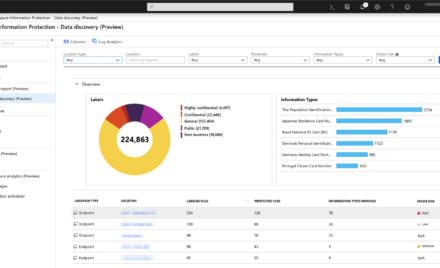 Windows Defender ATP allows security operations teams to detect and mitigate breaches and cyberattacks using advanced analytics and a rich detection library. With the April 2018 Update, automated investigation and advance hunting capabilities further enhance Windows Defender ATP. Sign up for a free trial. 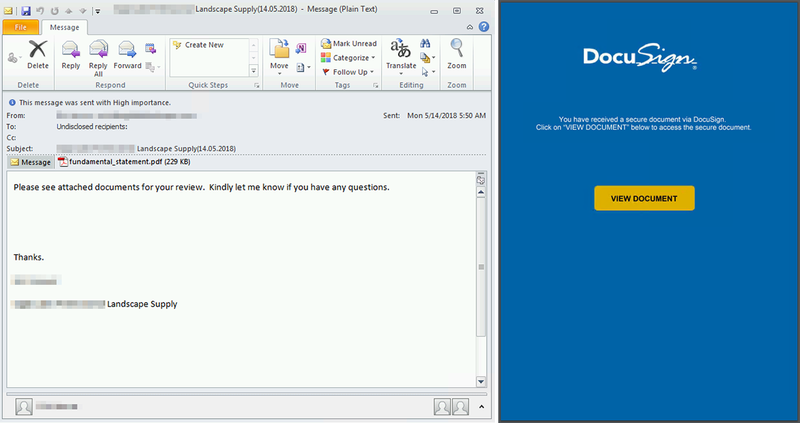 Machine learning also powers Office 365 Advanced Threat Protection to detect non-PE attachments in social engineering spam campaigns that distribute malware or steal user credentials. This enhances the Office 365 ATP comprehensive and multi-layered solution to protect mailboxes, files, online storage, and applications against threats. These and other technologies power Microsoft 365 threat protection to defend the modern workplace. 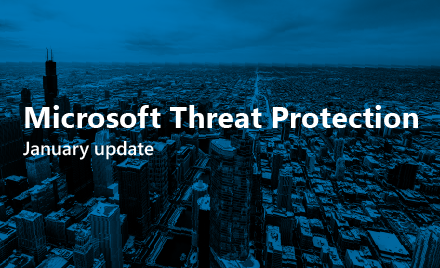 In Windows 10 April 2018 Update, we enhanced signal sharing across advanced threat protection services in Windows, Office 365, and Enterprise Mobility + Security through the Microsoft Intelligent Security Graph. This integration enables these technologies to automatically update protection and detection and orchestrate remediation across Microsoft 365.